Pokemon Go – gotta catch ’em all! A new game has caught people’s attention throughout the world. It is now a familiar sight to see people walking around the streets staring at their smart phones; all thanks to the newly launched Pokemon Go! After generations of launching Pokémon games, The Pokémon Company has come up with Pokémon Go, developed by Niantic. Pokémon Go is an augmented reality game that can be freely downloaded on Android and iOS devices. It is a location based game where the user has to walk around his surroundings and catch as many Pokémons as he can. The user catches the Pokémons by throwing red-and-white “Poke Balls” at them. The game gets access to the map of the current location and gives the player the directions to move about. The movements of the player are tracked and the location where a Pokémon may be found is displayed to the user. The game allows the user to train the Pokémons caught by him and make up teams which can battle against each other. The virtual creatures called as Pokémon appear on the device screen as though their presence is a reality. The gameplay is determined mainly by the current geographical location like if the user walks past a water body, he is likely to encounter water Pokémon and a park may contain the grass or bug types. Released on July 6, 2016, the game has quickly broken the records of many famous apps such as Tinder and Candy Crush Saga. It has been downloaded more than 7.5 million times in just the first week of its release. The logins on Pokemon Go are now way more than the popular social media apps like WhatsApp and Instagram. The number of users for this game is quickly growing and is all set to overtake the number of Twitter users soon. This has given a huge boom to the stock value of Nintendo. With the number of users for Pokémon Go soaring as the days pass by; the company has already announced that the game would have another upgrade in the form of Pokémon Go Plus. Pokémon Go Plus will have an optional Bluetooth wearable device which will alert its users when the Pokémon are nearby. In this way the user need not stay glued to his/her screen looking for Pokemons. The game is loved by many as it has a very huge advantage of making people active. Players get out of their houses and take a walk outside which does wonders for their physical and mental well being. However, this coin also has two sides – Pokémon Go has also created ripples in the form of keeping “Poke stops” at locations banned for public entry & people meeting with all kinds of accidents while their eyes are glued to their screens. 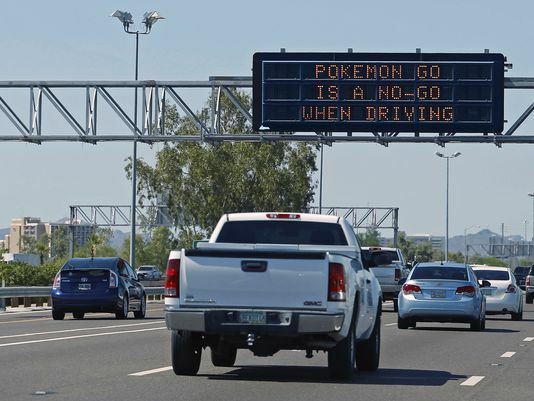 Some places have even put in rules to ban people from playing Pokémon Go in certain locations and also while driving. However, if due care is taken by the players, the game boasts of getting people up on their feet which it claims no other virtual game has done so far. And for that – way to go Pokémon Go! !